Recently colleagues Brian Jackson and Madeleine Vanderwerff proposed a great article on Decoding the Disciplines as the basis for Mount Royal University (MRU) Library’s Instruction Roundtable discussion. ‘Decoding’ is an extension of the threshold concepts discussions in higher education, aimed at making tacit disciplinary knowledge and problem-solving processes more explicit and more teachable. The process might be described as an archaeological excavation of one’s automatic disciplinary ‘moves’, led by a questioner with the relentlessness of a two-year old. Question follows question to dig through layers of assumptions, bringing the almost subconscious decisions we make as part of everyday work into the light. The approach seems promising for exploring library processes to make them clearer to students (how DO you know what terms to search with?) and/or new librarians (how DO you decide which materials to acquire? which committees to volunteer for? how severely to weed your filing cabinet?). How do you decide what to research? I see something interesting going on. Do you mean interesting to you or interesting to other people? Both I hope. But it has to start as something I’m interested in. What do you mean by interesting? Can you be more specific? Sometimes it relates to something I’ve been thinking or reading about for a while, often it’s something counter to expectations. Sometimes it’s an idea to transfer something from one context to another. What do you mean by ‘counter to expectations’? At this point the conversation went in multiple, intranscribable directions, from how I know something contradicts the literature to how I know an activity has bombed or succeeded and almost every thought in between. One of the insights that arose from doing just this brief exercise is how many of these ‘moves’ might be mysterious or difficult for first-year students when we ask them to “do some research”. How would they know what was ‘interesting’ and would they consider ‘interesting’ to themselves or their instructors? How could they build on, transfer or contradict ideas from the literature when they are just beginning to read it? I encourage you as part of the New Year’s new beginnings to sift through automatic actions, dust off disciplinary assumptions, and get down to the foundational strata of your own processes. The following questions all good starting points for solo pondering, but there may also be opportunities for deeper decoding with others on your campus. I’m hoping to join an MRU group this year. How do you decide what questions to ask? How do you decide what methods to use? How do you decide what data to use? How do you decide when to stop expanding the literature review to include one more small-but-extraordinarily-significant subconcept (if you know, please tell me)? How do you choose what journal or conference to disseminate results in? How do you decide which of the reviewers’ contradictory comments to address? Middendorf, J., & Pace, D. (2004). Decoding the disciplines: A model for helping students learn disciplinary ways of thinking. New directions for teaching and learning, 2004(98), 1-12. (Available from http://citeseerx.ist.psu.edu/viewdoc/download?doi=10.1.1.499.4107&rep=rep1&type=pdf). This is an excellent entry point to the concept, but there’s quite a bit out there in the literature, spanning many disciplines. Salter, B. (2008). 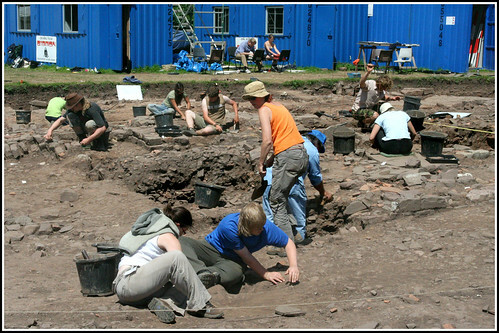 Archaeological dig. Retrieved from https://flic.kr/p/56obwm CC-BY. This entry was posted in Adjunct Member and tagged decoding, questioning, reflection, research, research process by vew908. Bookmark the permalink.